This article is about the enemy from Super Mario World. For the enemy mistakenly called Sumo Bro in New Super Mario Bros., New Super Mario Bros. Wii, and New Super Mario Bros. 2, see Sledge Bro. The Sumo Bro (or Sumo Brother) is a derived species of Hammer Bros. that appear as enemies to Mario. Their first appearance is in Super Mario World as somewhat uncommon enemies that can rain down fire on Mario's head by stomping. 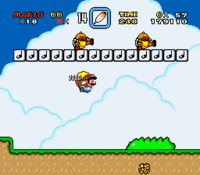 Mario avoiding two Sumo Bros. in Super Mario World. In Super Mario World, Sumo Brothers are large and orange in color and wear black shells. They also have a spike on top of their heads, meaning Mario or Luigi will be injured if they jump on one. They stand on top of blocks and attack Mario by stomping their foot (the sumo movement known as shiko), which causes a spark to drop below; this spark ignites when it hits the ground, making a wall of fire. A Sumo Brother can only be defeated by throwing a Shell at them, by hitting them with a Cape as Cape Mario or by touching them with Mario when he is powered-up by a Starman. Hitting the block they are standing on from below also works but is more difficult than other means due to the fires caused by their lightning-stomp attack. Their parent species, Hammer Bros, do not appear in the game at all. A Sumo Bro attacking Mario in New Super Mario Bros. U. After many years of absence, Sumo Bros. return in New Super Mario Bros. U, with the same abilities that they had in Super Mario World, except that they make electric waves instead of fire waves. Their only appearance is in the level, Screwtop Tower, and players can defeat them by hitting the platforms that they're standing on from below. They can also be defeated with iceballs, but can't be picked up. One Sumo Bro with a towel on his shoulders, known as Boss Sumo Bro, appears as a boss in Screwtop Tower, replacing Boom Boom. Kamek's magic has made him larger, and he now has the ability to jump. Unlike Boom Boom and Kamek, the Sumo Bro does not appear on top of the tower he guards. In New Super Luigi U, Sumo Bros. reappear in Sumo Bro Bridge and Sumo Bro's Spinning Tower, where the boss reappears as well. In Mario Golf: World Tour, one of the names that can appear on the tournament scoreboard is "Sumo Bro". Luigi encountering a Fire Sumo in the Super Mario World animated series. A single Sumo Bro, known as a Fire Sumo, appears in the Super Mario World television series episode "Mama Luigi". This Fire Sumo appears to attack Luigi as he is exploring the abandoned Dome City, stomping the ground beneath Luigi hard enough to cause it to crack, sending the plumber plummeting downward. In Unjust Desserts, some Sumo Brothers shrunken by Magikoopa are eaten by Yoshi, and two confront Mario in a tunnel inside the dinosaur. Mario defeats the two by jumping out of the way when they charge at him, causing them to crash into each other and become knocked out. If Mario smashes a Blue Shell thrown at him by a Koopa Troopa, the Sumo Brothers will awaken, but before they can renew their assault, they are sent tumbling down a passageway when the newly Winged Yoshi does a loop-the-loop. Later, some more Sumo Brothers try to attack Mario when he and Bowser's minions are forcibly ejected from Yoshi's body, but because they are still tiny, they are scared off by the seemingly giant Yoshi stomping around. In Brain Drain, a Sumo Brother will swap minds with Wooster if he hears the static emanated by Iggy Koopa's Synapse Switcher play on a hot dog stand's radio. After unsuccessfully trying to attack both Mario and Luigi, the Sumo Brother storms off in a huff over its weak new body. Later in the book, Luigi can encounter some more Sumo Brothers if he decides to head out on his own to look for Iggy and if he manages to steal several cans of Fungus Up cola from the Synapse Switcher in the WMUSH radio station. Sumo Bro makes its first Mario Party series appearance in Super Mario Party as a non-playable character. It appears in the minigames, Rattle and Hmmm, Absent Minded and Lightning Round. A Sumo Bro using its Super Mario World appearance also appears in Puzzle Hustle. Romanian Foc Sumo (Super Mario World animated series) Literally "Sumo Fire"
The Super Mario World artwork of the Sumo Brothers lacks the spike on their heads. However, the spike is present in the games and later appearances. Although they do not appear in New Super Mario Bros., New Super Mario Bros. Wii, and New Super Mario Bros. 2, their name is mistakenly applied to a related species of enemy known as Sledge Bros.
↑ Super Mario World English instruction booklet, page 26. This page was last edited on April 9, 2019, at 02:53.